Wow, it’s hard to believe we have been in Stuart for almost two months now. It has been a very productive but expensive time. 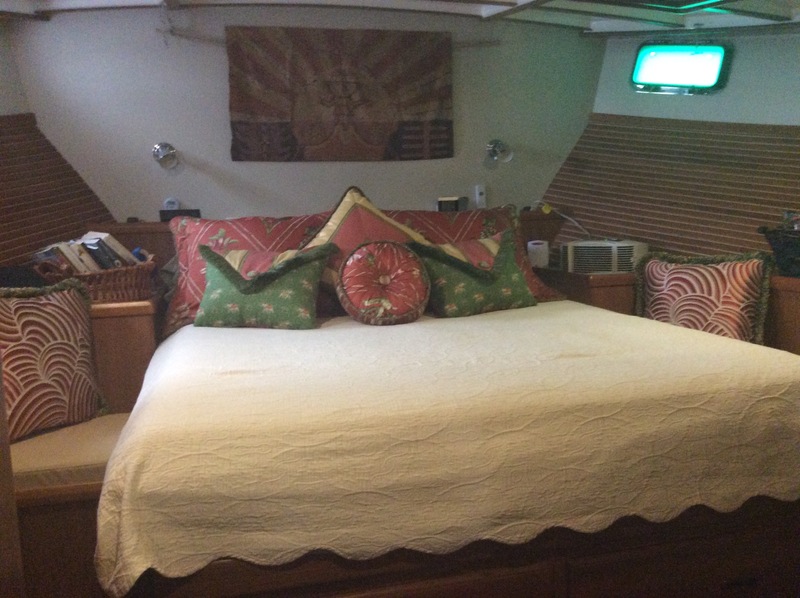 Our major project was to completely redo the interior cushions and rugs. With the help of Guy and Gary at Saturdays Interior Decoration, Idyll Time’s new interior looks beautiful. We are very happy with how everything turned out. 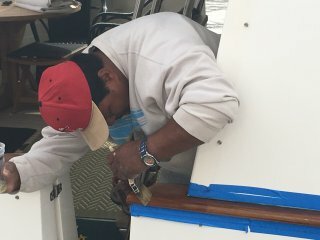 While the interior was being updated, Angel and his crew did their magic on our exterior teak cap rails. They applied two additional coats of the Awlbrite Clear on top of the two coats they applied last year. 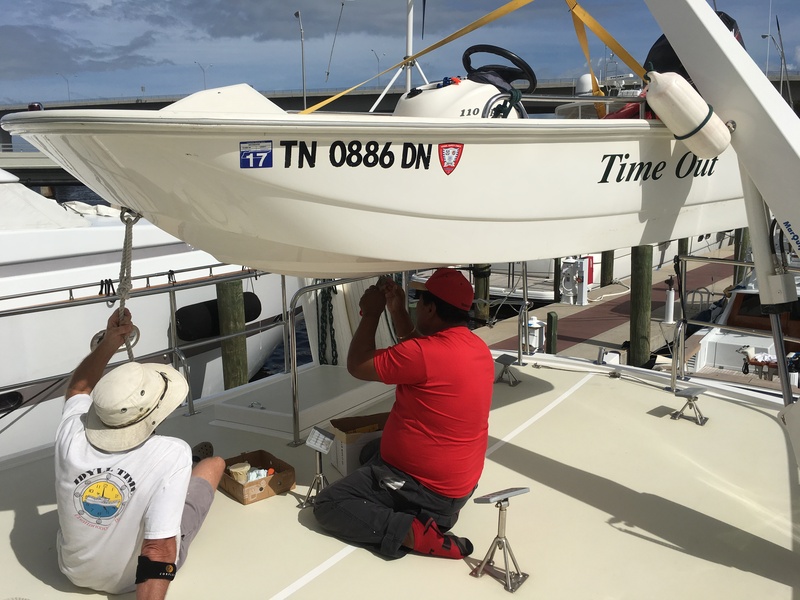 While he was here, we also had Angel repair some gelcoat bobos on our dinghy Time Out. The fine folks at G & G Canvas were able to fit us into their schedule and made a sunbrella cover for our storage lockers up on the bow. 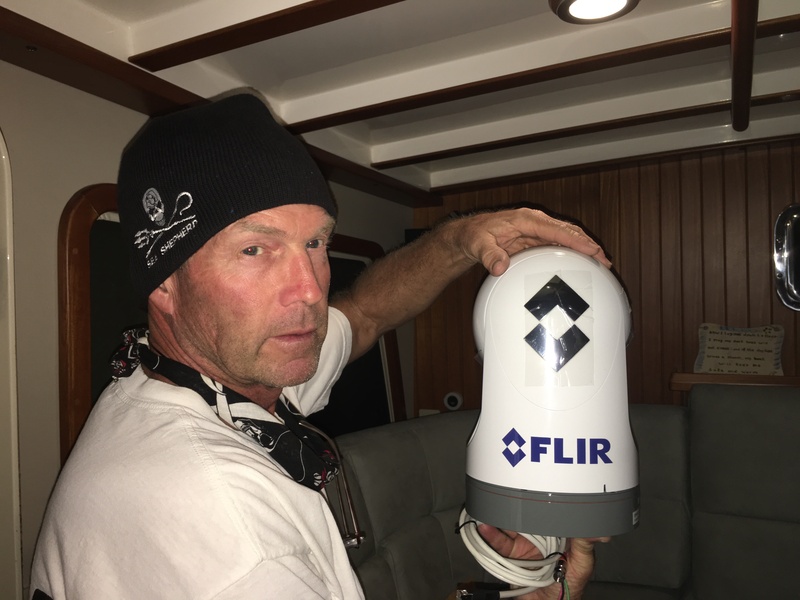 Jeff’s big Christmas present to himself was a new FLIR. With this fixed mount night vision camera, we should be able to see objects quite well during our overnight runs. Jeff and Scotty, our electronics guru, worked into the wee hours several evenings installing this new piece of equipment. We are looking forward to trying this out on our next offshore run. Between boat chores, we found time to squeeze in visits with all of the other Krogenites here at Sunset Bay. At one point I counted 28 other krogen boats here in the marina. Each Tuesday morning, we all gather at Mulligans Restaurant in downtown Stuart for breakfast. We usually take over the entire restaurant with our boisterous group. Most Tuesday’s we have between 40 and 50 attendees, some aboard boats and others coming by land. The record number for the year was 58 people. 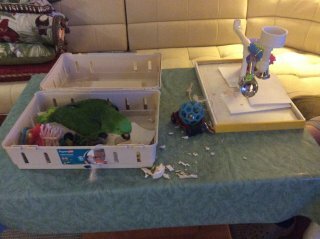 Nate, our Amazon Parrot, also had a busy social life here in Stuart. 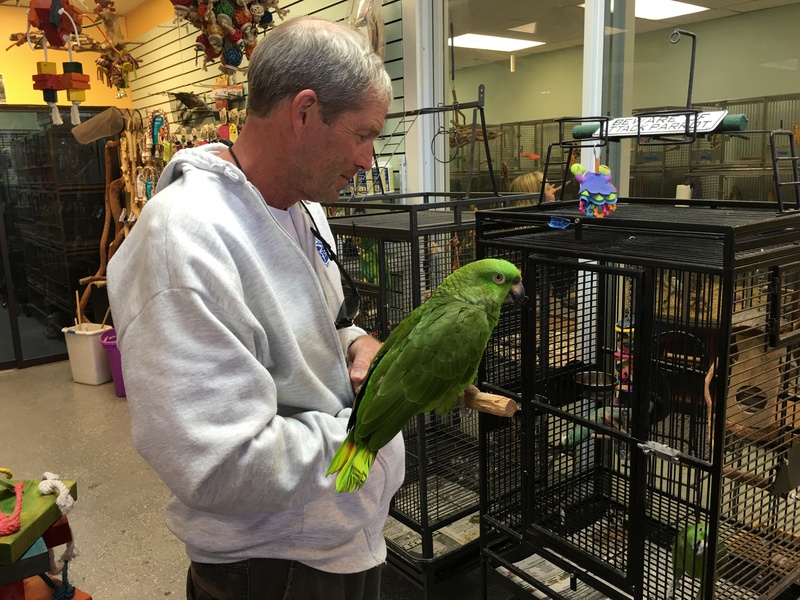 We found a great bird store, Birds on Safari, a few miles from the marina. After learning that they board birds, we decided this would be a good fit for Nate while we made a short trip by airplane back home to TN. Having never been boarded in his 38 years, we were not sure how he would handle this. We broke him in slowly by first letting him go visit the bird store for several hours. After a few successful day trips, we decided to let him stay overnight. He seemed to actually enjoy being around the multitude of fellow birds. His two night stay went well and he was rewarded with a new play toy. A later trip to the bird store was made for Nate’s twice a year trimming of beak, wings, and nails. He wasn’t too happy about this outing but it’s all forgotten now. To facilitate Nate’s travels back and forth to the bird store, we purchased a new travel carrier. To get him used to the new carrier, we took him on several walks around the marina. The vented slots on the sides allow him to peek out at all the new sights. He seemed to enjoy this new daily event. We did however get lots of questions and strange looks from the other boaters. We have learned that most airlines will allow parrots to travel under the seat in a carrier of this type. We are hoping to fly with him in the future. 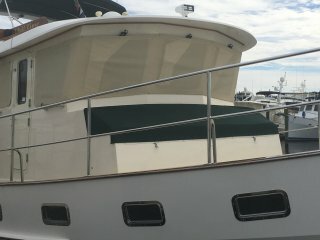 This would make travel back and forth to the boat much easier. We had some excitement late one night aboard Idyll Time, but not the enjoyable kind. About 11 PM, Jeff heard a strange pop come from up in the pilot house. 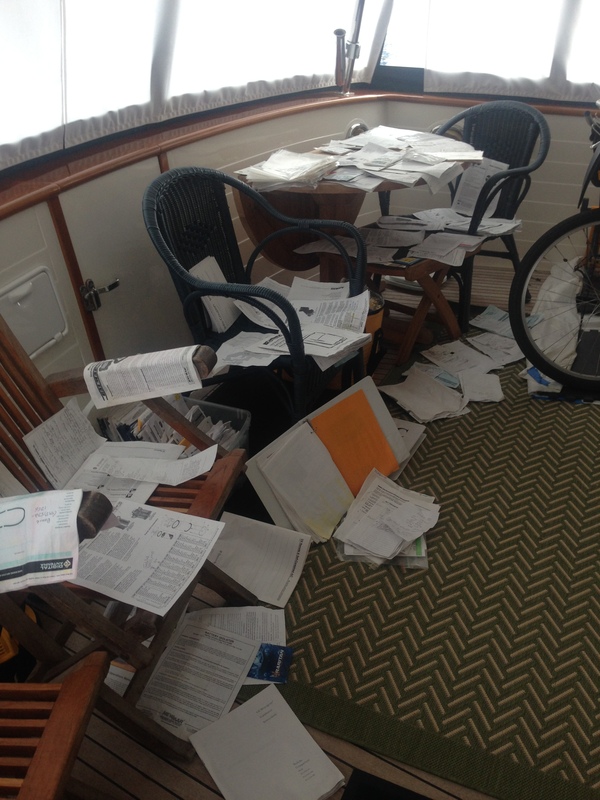 When he went to investigate, he found the pilot house floor covered with about 3” of water. Well it wasn’t raining outside so where did all the water come from? Opening up the cabinet under our instrument dash, it looked like Niagara Falls in there. Jeff quickly shut off our water pump to halt the flood. We spent the next three hours bailing out the water and then removing the rug to dry. The good news was none of the water had reached any of our electronic equipment. 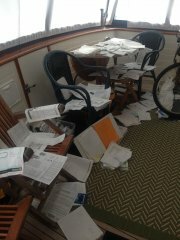 The bad news is all of our boat records and instruction manuals were soaked. 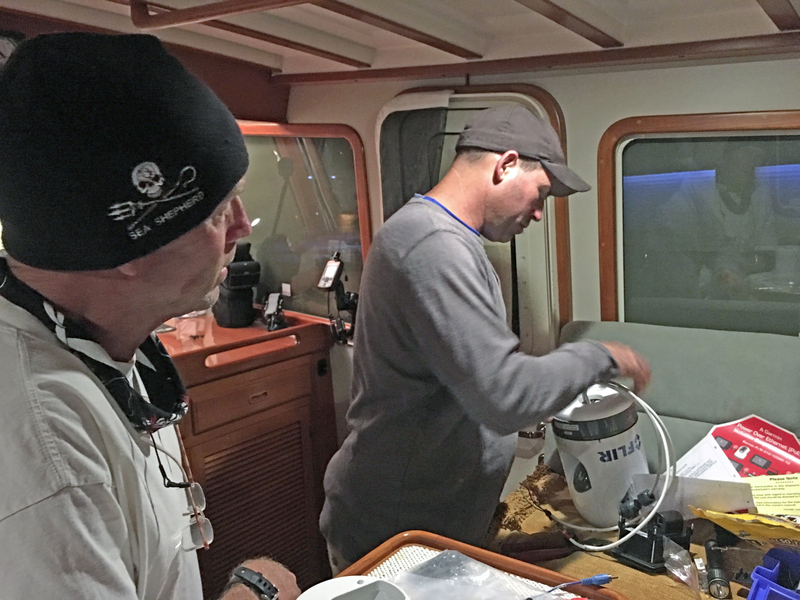 A 7 AM emergency call to Scotty was made the next morning and he was soon aboard to diagnose the problem. 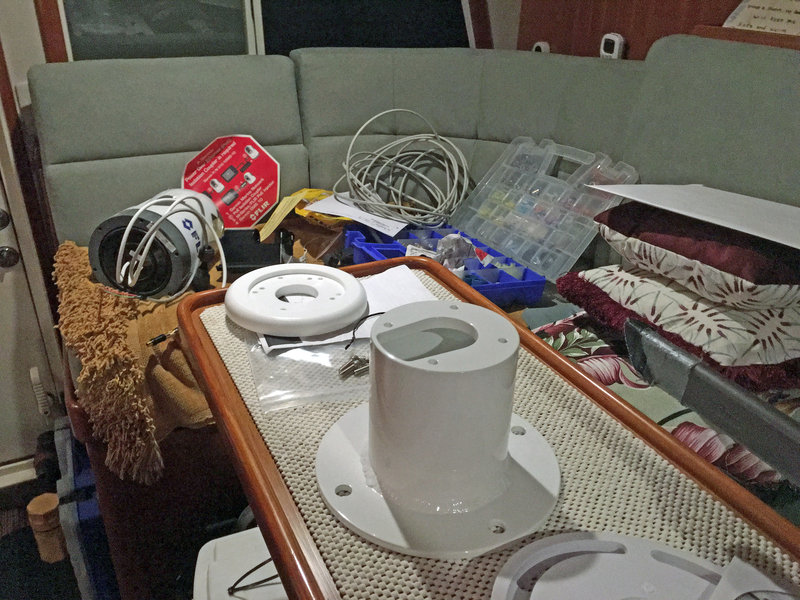 A quick look under the dash, and Scotty knew immediately what had caused the flood. 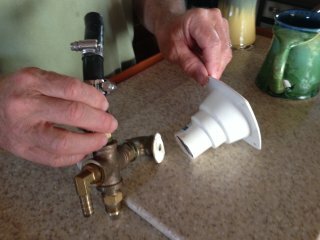 Our shore water inlet valve had broken at the back of the housing. This plastic fitting was connected directly to our house water line and is always pressurized. When this let go it was pumping 60 psi and 5 gallons per minute from our water tank into the pilot house. We were lucky to have been aboard and realized what had happened. Had we not, our 350 gallons of house water would have quickly emptied into the pilot house. Since this incident, we now turn off our water pump both at night and whenever we leave the boat. Although anxious to continue south, it seems a little sad to be saying goodbye to Stuart and all our Krogen friends here. We hope to see many of these fine folks in the next few months either in the Keys or Bahamas. It looks like we will have a small weather window to push away from the docks this afternoon. 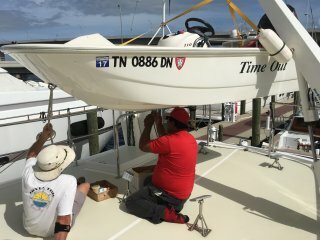 We plan on running overnight down to the Keys and into Marathon. 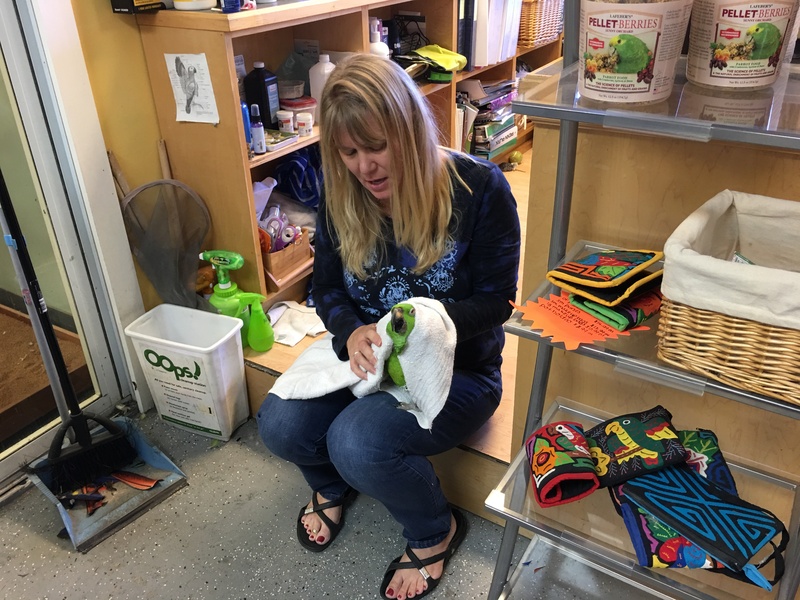 This entry was posted on January 30, 2016 at 5:16 pm. You can follow any responses to this entry through the RSS 2.0 feed. You can leave a response, or trackback from your own site. 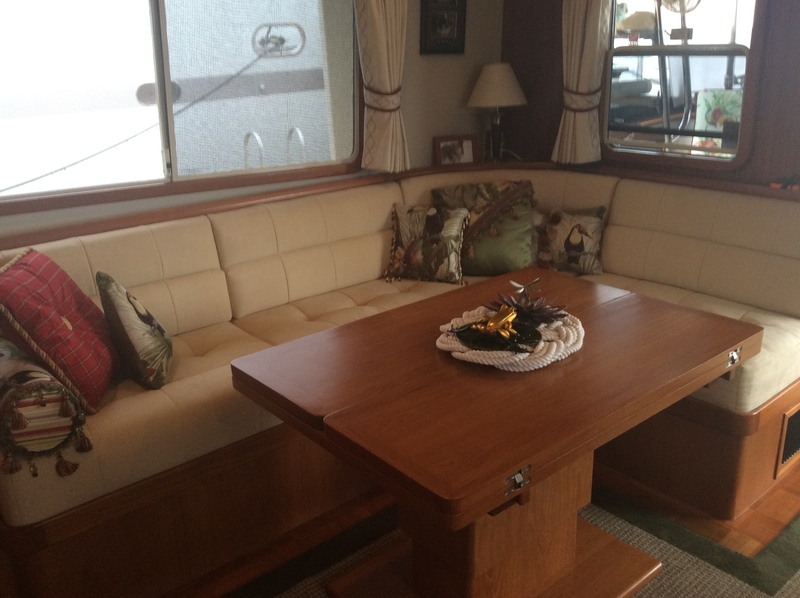 1 Response to "Stuart Florida January 2016"
New KK48 owner. Had the same thing happen to our aft pressure water fitting. Lucky to have a replacement fitting but the whole pressure water system is poorly designed to allow even tank water to flood the boat if the pump is on (or using city water) if/when one of those fittings fail. Did you happen to find a better replacement? I’ve looked with no success. BTW, both my wife and I are thoroughly enjoying your blog(s) and appreciate your comments on KK operation and maintenance.